No, if you, if you're going to take me all the way back, I can only say that my mother used to cover me up when I was in a crib, she told me, because my head was like a hexagon. It wasn't round, it was, it had shapes, and, and she said that people used to come and look at me, 'What's that'? She says, 'That's my son'. 'My God!' Because my head was a shape, hard shape, I think that was a foretelling eventually what's going to happen, you know? And so, she put a curtain on this thing that she pushed me around. You know the curtain? So the people wouldn't see me because the comments she was getting from everybody, but that made things a little easier for her to deal with me as a, as a six-month-old or whatever I was, you know? Yeah. But you have to go through those ages. [Q] Is, Judy, is younger than you? [Q] Did she have a…a? No, no it was normal. I was abnormal, with that shape I looked like... it was probably a foretelling what's going to happen, because eventually it became shape, you know? It had sides to it, and she said people were laughing at me and that's what that... But I had other weird situations, I think. I think I grow my bone, or whatever, because she said I used to walk around on the street with my hands behind me, like this, you know, how elderly people walk like that. And I used to do that when I was like three or four years old, to walk to like that, on the street. Now it's nothing weird, isn't it weird? [Q] I guess. This was in Hungary? 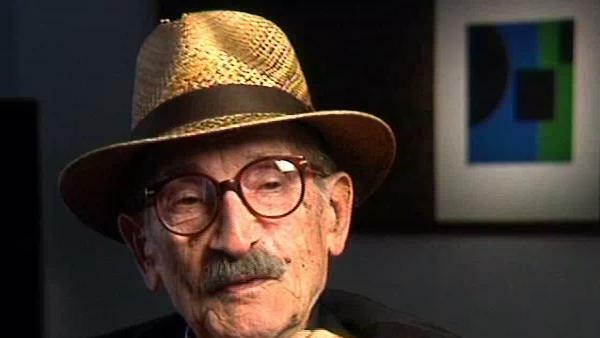 The late Hungarian-American film-maker Jules Engel is best known for his contribution to the field of animation. His work includes the dance sequences in Walt Disney's 'Fantasia' and the creation of 'Mr Magoo'. His films and lithographs are housed in museums all over the world and have won many awards. Tamara Tracz is a writer and filmmaker based in London. William Moritz received his doctorate from USC and pursues parallel careers as filmmaker and writer. His forty-four experimental and animation films have been screened at museums in Paris, Amsterdam and Tokyo, among others. He published widely on Oskar Fischinger, James Whitney, Bruce Conner, the Fleischers and 200 pages of animation history for an AbsolutVodka website. He wrote chapters for the "Oxford History of Cinema", appeared in several television documentaries, curated art exhibits and received a lifetime achievement trophy from the Netherlands Royal Academy for his work with visual music. He has served on film festival juries and received an American Film Institute filmmaking grant. His poetry and plays are also performed and published. He is a leading expert of Oskar Fischinger and recently published a biography of him. He teaches at The California Institute of the Arts.